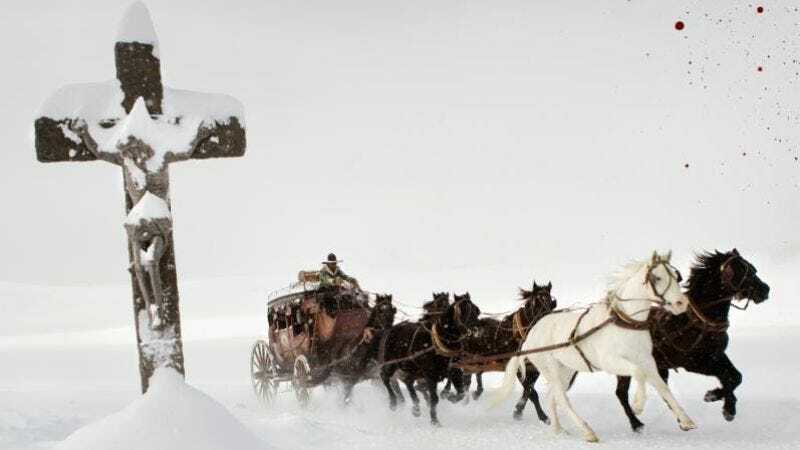 When Ennio Morricone’s soundtrack for Quentin Tarantino’s The Hateful Eight is released on December 18, it will be somewhat of a momentous occasion. Not only will it mark an historic collaboration between two giants of cinema, but it will represent Morricone’s first score for a western in more than 30 years. Yes, although his contributions to the language of Spaghetti Westerns—particularly in the scores for The Good, The Bad, And The Ugly and other Sergio Leone films —have cast an imposing shadow over the entire outlaw genre, the Italian composer has not actually scored a western since Michele Lupo’s Buddy Goes West in 1981 (which you’ll be forgiven for having forgotten existed). To commemorate what a big deal this is, the soundtrack will be available in an exclusive vinyl edition in the U.S. through Jack White’s Third Man Records, in addition to the regular CD, vinyl, and digital soundtrack release through Decca Records. zThird Man’s double 180 gram LP will come in a tri-fold reversible jacket with a soft-touch finish, and will include two posters and a 12-page booklet insert featuring stills from the movie. Aside from Morricone’s incidental music, the album includes snippets of Tarantino’s dialogue and songs by the White Stripes, Roy Orbison, and David Hess.